Home Grooming Best Dog Smelling Shampoo And How To Choose One! Best Dog Smelling Shampoo And How To Choose One! Nothing in this world is as best as a fresh, clean smelling dog to me. That’s why if there’s one thing I could do all day, it would be cuddling and tickling my pet best friend. Do you know that there are benefits of cuddling your dog? That’s why you should do it more often. However, as a long time dog owner, I know keeping the fresh smell of a lovely pet can be a challenging task sometimes. Believe me; I also had days that I had to endure the musty smell of a dog odour, and this can be very uncomfortable! Have you been to the same boat as I am? Always wondering why your dog stinks? Well, I am pleased to let you know that I have created a list of the best smelling dog shampoo that is highly recommended for your dogs. This list provides you with some of the greatest options you can consider when you want your dog to smell good and feel clean all the time. Are you excited to know what these products are? Well, we’re about to find out! But before that, let me give you first a quick guide on how to give your dog a bath. Bathing your dog regularly can make her more pleasant to be around. However, most of them would rather skip bath time. This makes the whole method a bit tricky! So I am giving you tips to make the task easier and stress-free. If you own small dogs, then you're lucky if you can just plop them on the laundry tub, but if you can't, then the bathtub or the shower would be a great area. At least try to find a room with a closed door; this will avoid a damp and edgy dog fleeing from a bathing session. Furthermore, make sure as well that your dog will be standing on a non-skid surface; we don’t want any injuries from supposed to be a fun bath. All the things you will need when bathing a dog should already be handy before you begin washing your furry friend. In this way, you will be sure that you won’t be leaving a frightened dog alone just to get a towel on the other side of the room. Before you even begin, try to let your dog get comfortable with you and the surrounding; bringing in toys and offer treats would be helpful. Brush your dog first too to remove any snarls on its fur; matted hair will hold water that will leave your dog with irritated skin. Place cotton balls in her ears and drop some mineral oil on both her eyes, to keep water and suds from getting in them. Check the temperature of the water before you spray it to your pet; it should not be hot enough as dog’s skin gets burn more quickly compared to us. Lather and scrub the shampoo thoroughly. Any soap residue on your dog’s fur may irritate her skin once it gets dry. So rinse more than you think you should be. Now you might ask how often you should bathe your dog. Well, they do need regular baths like once in every week, but the frequency will mainly depend on several factors like the type of your dog's coat or the environment you are in. When we talk about dog shampoo, you should take note that one size doesn’t fit all. So make sure that you will be choosing wisely for your dog to have a shiny coat for days. Here are some tips that you should consider. If you notice that your pet has frequently been scratching her body after a bath, then there might be a possibility that the shampoo you used had caused her skin to dry. There are shampoo contents you should be wary about as it may lead to adverse health effects. These ingredients are parabens, mineral oil coming from petroleum DEA cocamide. DEA cocamide, for instance, has been found to be carcinogenic or cancer-causing. We are all familiar with how our dogs can always find their way into the garbage, so for your adventurous friend, I suggest you choose a deodorising shampoo. This will help get rid of the unpleasant odour instead of just covering it up. There are times that dog's fur gets lifeless and dull. Fortunately, there are shampoos that come with minerals, proteins and vitamins that help restore hair's healthy shine. If you notice that your pet has been infested with pesky parasites, it would be cost-effective to opt for a shampoo that prevents or at least control fleas and ticks but make sure that the ingredients are not that harsh. Dog shampoos come in different price denomination. The expensive ones don't mean to be the best, while the cheap ones are not necessarily a substandard product. This is why it is essential that you go through the reviews of different dog shampoo products to get a fair idea of what your pet needs and be able to get the one that suits your budget. Anyway, you might be wondering if you can just use human shampoo. I know this would save you a lot! However, human skin is a lot different from our pet’s skin. The canine’s skin is being protected with an acidic top layer that helps avoid viruses and bacteria infestation. Human shampoos will only take out this protective coating. So I highly suggest that you don’t use your shampoo to your dog. So we've learned some tricks on how to bathe a dog and how to choose a dog shampoo, it's time that we unveil what is the best smelling dog shampoo! Keep on reading below to discover. Here’s a dog shampoo that features that scent of almonds and cherry to get rid of a wet dog smell. 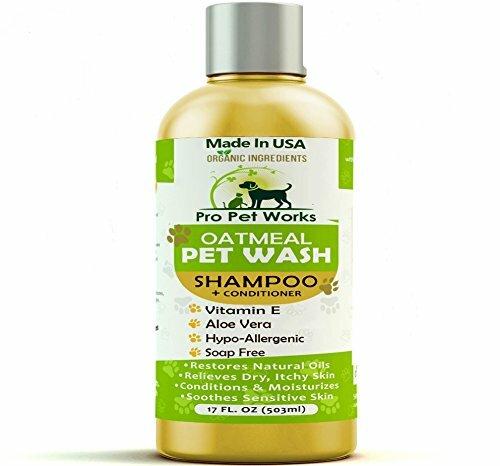 Pro Pet Works Oatmeal Pet Wash Shampoo + Conditioner cares for the needs of your pet that it formulated this product to make sure that it will be tough on the dirt, but not on your pet. It put together the natural ingredients of organic almond oils, aloe vera gel as well as Vitamins A, D & E so that it won't strip your dog's coat oils and natural minerals. The ingredients will keep your dog's skin moisturised and at the same time bring out the natural shine and luster of her fur. They also do not also irritate your puppy's nose and eyes during the bath. What I like about this product is how it detangles my dog’s fur and makes brushing a pleasurable activity. Plus it saves me a lot from going to the groomer. Earthbath has been very popular for their fully natural dog care products that are wisely formulated to successfully clean dirty dogs. Their products have been formulated with natural ingredients and are guaranteed to be cruelty-free. I was very impressed upon learning that even their packaging is biodegradable. Wouldn’t it be nice to know that you won’t be hurting your dog but as well as the environment? Anyway, I’m sure you would be pleased with this shampoo’s heavenly scent. It has almond and vanilla extracts that make sure your dog will be beautifully scented. In addition to that, the oatmeal and aloe vera combined with purified water will help your dog fight and heal any skin irritation and itchy parts while at the same time efficiently moisturise her hair and skin. It also has Vitamins A, B, D and E.
I like how this product lathers and rinses easily too. I have a dog who gets scared every time I give her a bath, so this shampoo has helped me finished as fast as he wants to get out. Might not be efficient for dogs that are severely smelly or dirty which require a heavier duty shampoo compared to Earthbath’s all-natural offer. OxGord Pet Wash Shampoo is Amazon’s best seller in dog shampoos plus conditioner. It is 100% all natural and organic that is particularly formulated for dogs with dry, sensitive skin and coat. All of the ingredients can be seen on its bottle, so you would know what exactly you are putting on your pet. Ingredients include oatmeal, aloe vera, rosemary, coconut oil, jojoba oil and shea butter. My veterinarian recommended this shampoo due to its delicate blend of essential oils that can keep your dog's skin and coat shiny and healthy all the time. What's even more? This shampoo is soap and tears free! I am sure this would give you a fun and enjoyable bath time experience. Safe to use that it guarantees not to irritate or inflame your pet’s nose and eyes. Freshness does not last long compared to other dog shampoos. The fragrance is not that strong since it is all natural; if you want a shampoo that is heavily perfumed, then this product is not recommended for you. his means FURminator deShedding Ultra-Premium Shampoo will only not keep your dog smell good all the time but will also provide solutions in de-shedding, conditioning and hygiene. Furthermore, this product also contains Omega 3 and 6 fatty acids, papaya leaf extract and calendula extract to give you the best results. There are customers saying that it did not decrease the shedding of their pet regardless of what it claims. Fieldworks Natural Dog Shampoo may be the last in our list of best smelling dog shampoo, but you can never take too lightly the features of this shampoo. It is made up of different unique ingredients, each of which plays a specific role. For instance, the neem oil will help soothe and moisturise your pet's dry, itchy skin as well as get rid of fleas and other skin irritating pets while the bentonite clay certainly wards grime off from the dog's skin. It also has argan oil, nutmeg and rosemary that will keep your dog’s skin and fur healthy and silky shine. On the other hand, its vetiver ingredient, which is a natural-born antiseptic, will make sure that your dog will ways smell the scent of great outdoors. When choosing for the best smelling dog shampoo, always make sure that you will only purchase those with natural ingredients to avoid irritating your dog's skin. The five products mentioned above are already healthy choices; they are not only affordable, but they are also safe and efficient. But if you are still confused which of the shampoos to choose, I highly recommend the Pro Pet Works Oatmeal Pet Wash Shampoo + Conditioner. This product is the only shampoo that comes with conditioner and its scent last longer than others. This shampoo is definitely worth its price! How about you? Which shampoo do you think would be better for your pet? Do you still have some more questions about dog shampoos? Don’t hesitate to ask me by leaving comments below. Share this article with your friends too. Next articleWhen Do Huskies Stop Growing And How Big Can They Get? Hello there! I am Ana, mother to three lovely dogs. I’ve created PupTipper to share with you my passion in giving the best to my furry family members. When it comes to dog ownership, I have you covered and I will help you ace it!